This post was written by Hatchet reporter Margaret Kahn. 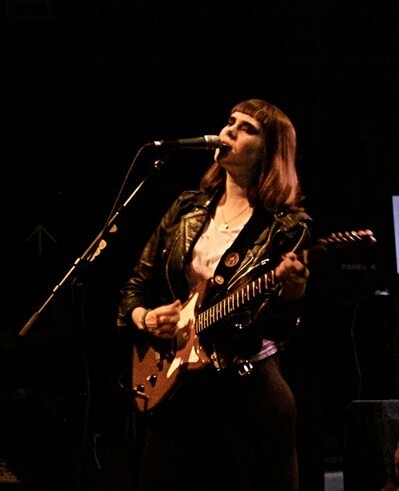 Kate Nash may be on a mission to outdo James Franco, the unchallenged king of multitasking. The singer chuckled at the comparison, but can’t deny that she’s been busy. These days, Nash’s agenda includes acting, managing her own record label and overseeing an organization with the aim of empowering young girls, Rock ‘N’ Roll for Girls After School Music Club. Nash is performing a sold-out show at the 9:30 Club Nov. 11 at 7 p.m., and she’ll show shot off a musical repertoire that has evolved from soft, quippy tracks to heavy, punk-inspired singles. Nash’s debut album, 2007’s “Made of Bricks,” was composed of simple tunes that employed Nash’s lilting voice over piano and an occasional drum machine. “Girl Talk,” released in March, is thrashing and loud, full of clanging drums and guitars. “What I’ve gone through, some of my difficult stuff [brought me to punk,]” she said. Nash suffered from a nervous breakdown while touring in 2008. But when record label executives dropped her from Fiction Records after disappointing sales on her second album, “My Best Friend is You,” Nash dropped the bitterness and plunged into independent artistry, creating her own record label, Have 10p Records, and produced “Girl Talk” herself. She also produced the first album of American teen indie band SUPERCUTE! this year. In the midst of touring for her latest album, Nash is also celebrating the third film she has acted in, “Powder Room,” which is slated for a Dec. 6 release in the United Kingdom. Nash is also maintaining work with the Rock ‘N’ Roll for Girls After School Music Club, which she founded in 2010, to help aspiring young musicians in the United Kingdom.